It’s live! After years of planning and months of work with our developer, Eli Van Zoeren, we’ve finally pulled back the curtains on our new Internet infrastructure. If you’re reading this in email, head over to the TidBITS Web site to take a look and click around — all 28 years of TidBITS articles and comments are there. I’d like to explain more about various aspects of the system, since it’s vastly different from the homebrew system that Glenn Fleishman created for TidBITS nearly a decade ago. Yes, it really has been that long. Most things are better, of course, but we did have to say goodbye to some features that were too confusing, too little used, or too hard to reimplement. And some things are still up in the air — the TidBITS News iOS app, for instance, doesn’t work right now because WordPress puts out a differently formatted RSS feed. Either we’ll figure out how to redo the feed, or Matt Neuburg will figure out how to make it parse the new feed. First off, if you previously received TidBITS via email, we’ve sent you an email message encouraging you to set a new password and log in to the site. As I noted in “How Accounts Work in the Next-Gen TidBITS Infrastructure” (25 March 2018), it was impossible to bring over passwords due to them being encrypted to protect against hackers. When you get that email message and click through to change your password, the system will ask for your email address (the one at which you receive TidBITS, if you have several) and send you a reset password link. When you load it, our site will suggest a strong password for you. You can accept it or generate a new one — either way, we strongly recommend that you store it in a password manager like 1Password or LastPass. You have to log in after setting the password. If you haven’t gotten that email message, or wish to reset your password manually, click Log In in the upper-right corner of the site, click Forgot Password, and enter your email address to start the process of getting a new password. Once you’re logged in, you should remain logged in until you log out manually. Thanks to our TidBITS members, whose financial support made this transition possible. Modern Web design and development is expensive, and you can think of the site as costing in the price range of a small car. We’ve been saving for years to pay for this transition, and we need your support more than ever to afford the servers, pay authors, and keep food on the table for our employees. I emphasize that because a scary change we had to make involved cancelling every automatic membership renewal at eSellerate, our former payment processor. Because eSellerate has been in maintenance mode for years, we felt that it was essential that we switch to a new system. As such, everyone will have to renew manually at their next expiration date, although people who prefer an automatic renewal can sign up for that again. Our new system relies on the Paid Memberships Pro plug-in for WordPress and uses Stripe for the actual payment processing. We hope that you’ll find the process faster and easier than before. 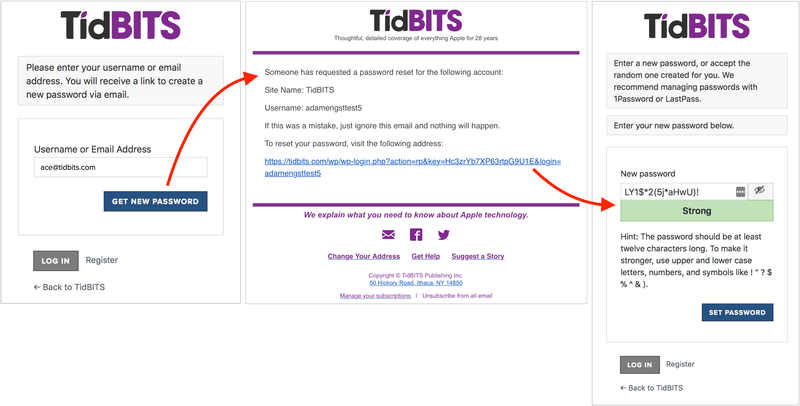 Once you log in to your TidBITS account (you’ll need to request a new password because all old passwords were one-way encrypted), you can see when your membership expires and easily renew or change levels. Paid Memberships Pro will send you email when it’s time to renew. As before, you need to be logged in to access the membership perks, such as discounts on Mac apps, and to view the site without paid banner ads. To find your full-text RSS feed, log in and click the Account link at the top of the page. On the account page, at the bottom, you’ll find your personalized full-text RSS feed link. It’s astonishing how much Web design changes over time. When we designed our previous site, it felt sleek and modern. But now I can barely express how dark, small, and cluttered it looks to me. The old design had been in place for so long that when presbyopia hit my eyes in my mid-40s, I had to bump up the size of my own site in Web browsers so I could read it. As you can see, we went for a much cleaner layout, with more white space to improve readability. We radically reduced the navigation and console-like graphical trimmings to focus on what’s most important—the content. You’ll likely notice our new logotype at the top of the home page. Designed by the talented Geoff Allen of the Denver-based design house FUNISOK, the logotype starts with Avant Garde, but Geoff tweaked every letter so, for instance, the first T’s horizontal bar slides into the i’s stylized dot, which is meant to evoke the leaf in the Apple logo. Each letter has both sharp and rounded edges so they flow well together. And we’re using a deep, rich purple to separate the BITS from the Tid, tying the two together with color in the leaf as well. You may also notice the new square favicon, which connects the black T and the purple B. The site uses the Proxima Nova font for both headlines and body text. Proxima Nova turns out to be wildly popular, although we came to it by way of Avenir Next, which is one of my favorite fonts these days (but isn’t as easily licensed). We played with some alternatives to mix the sans-serif Proxima Nova with a serif font, but nothing grabbed us. Unfortunately, due to font limitations in email, we can’t use Proxima Nova for the issue or for the articles that TidBITS members can receive as we publish them. At the very top of the page are the most important links and controls: a Search field on the left and a Log In link on the right, plus, when you’re logged in, an Account link for checking and changing your membership information, email address, and so on. Weekly Issues: For those who think of TidBITS in weekly terms and want to catch up issue-by-issue, this menu provides one-click access to the past five issues, plus a list of all previous back issues. Issues used to be named along the lines of “TidBITS#1394/13-Nov-2017.” Since that name is used for the Subject line of the email issue too, we’ve moved to a descriptive name like “#1410: Finder freezes, Apple TV 4K HDR, reading on the iPad, TidBITS transition.” As readers had pointed out to us, there was little point in wasting space in the Subject line on the word “TidBITS” since it was in the From line, and date usually matched up with the Date line. We hope the descriptive Subject lines will encourage more people to open the issues. Membership: As I’ve said, TidBITS members are the main reason TidBITS exists these days. So we made the membership-related navigation prominent. 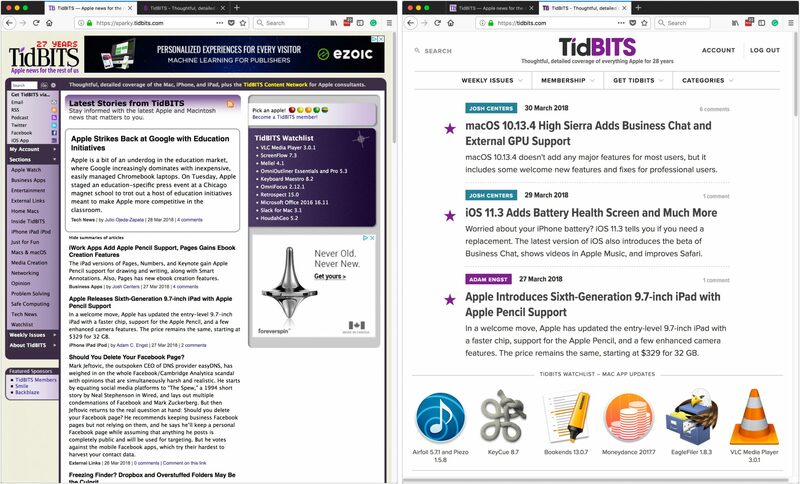 Get TidBITS: We provide TidBITS in a variety of ways, and this menu links to all of them, including the excerpt-only RSS feed for non-members. It also links to our SlackBITS group and to the new TidBITS Talk forum on our Discourse server to make them easier to find and join. Categories: Although most people don’t navigate by category, we included this menu partly so someone who’s new to TidBITS can see at a glance the kinds of things we cover. It’s also how you can see the full list of Watchlist items, via the Mac App Updates category link. At the bottom of the screen, you’ll find more navigation to various administrative pages. Nothing much interesting here, but it’s where everyone is conditioned to look for such info. Our site has two primary page types: headline pages and article pages. The headline pages include the home page, category pages, issue pages, series pages, and search results, and they all show lists of articles — sorted by date — with short excerpts. Clicking a headline takes you to the full article. Each entry on a headline page also shows some metadata, including author name, date, and comment count, plus a Listen link if there’s an audio version of the article. The author name is clickable and takes you to a listing for that author. Similarly, clicking the comment count takes you to the bottom of the article to read the comments. You’ll notice a purple star next to a few articles at the top. They’re “sticky,” which is to say, they sort to the top of the site regardless of date. That’s to keep major articles in the most prominent spot even as we publish less important articles later on. In two spots on the home page, under the third article and under the twelfth article, you’ll see a row of six app icons. Clicking one takes you to the Watchlist article about that app’s recent update. We were surprised at how popular the Watchlist items were in our last reader survey, but since we publish a fair number of them every week, we didn’t want them cluttering the main article list. This row of icons works well for providing some visual interest and, frankly, providing exposure to some of our favorite Mac apps. We do still have ads on the site, but they appear in only two places: between every few articles on most headline pages, and at the end of each article. However, we’ve decided to have some fun with ads, since we were unhappy with how random they’d gotten via Google AdSense on our old site. Second, we’re exercising more control over what appears. We have banners for our sponsors — Smile and Backblaze — and we have banners for the MacTech Pro events and the ACEs Conference since TidBITS is a media sponsor for both (in part because they’re great — if you’re an Apple professional, we recommend going). And to help our friends who are Take Control authors (and because we have a vested interest in seeing Take Control succeed under Joe Kissell’s leadership), we’ve also put up banners for recent Take Control books. More interesting, though, are the banners that expose great TidBITS articles from the past that are otherwise buried deep in our archive. To break things up even more, we’ve also generated some banners with Steve Jobs quotes. I’ve been too busy to make many of those, but we hope to generate quite a few of these non-ad banners. Another goal is to make a bunch of banners that are interactive quiz questions with an HTML5 editor called Hype that’s available in the Setapp subscription service. We have a ton of these from the Mac trivia game show we’ve done at the MacTech Conference for the last few years, and this seems like a fun way to let people test their Mac knowledge. I say all that in part to suggest that you might want to pay more attention to the banners than you would otherwise. As before, TidBITS members won’t see the paid ads from Smile and Backblaze. I won’t include a screenshot of an article page, since you’re in one, but I do want to explain some of its elements. Featured Images: Most obvious is the fact that some articles now have a photo at the top, with the title and metadata superimposed on the image. The design doesn’t require us to add these, so we’ll be feeling our way into how well they work and how much effort they take for us to find on sites like Pexels, Pixabay, and Unsplash, or how much they cost to commission from our photographer friends. We can even give credit where it’s due in the lower-right corner. Social Media Buttons: There are three social media buttons on the left side, which scroll with the article so they’re still accessible once you’re done reading. Honestly, they’re our final attempt to see if social media sharing is worthwhile — we’ll be watching stats to see if they encourage more people to share our articles and generate traffic that way. Note that they are purely local links and have no trackers associated with them! HTML Headings: Previously, we had only the concept of bold sub-heads that could lead into a paragraph. No more. We’re using full HTML headings, although I doubt we’ll nest things more than a level or two deep. Along with providing some hierarchy, the headings space out the content more so it’s not so dense. Screenshots: Images within an article should be vastly better than on the old site, which downsized everything in non-optimal ways. We can size images directly in WordPress, and if the full image is larger than what appears, you can click it to expand it. Screenshots can even have captions now. Related Articles: At the bottom of every article, you’ll see a Read More About This Topic row that contains up to six related articles — click one to read the article. We’re relying on a WordPress plug-in called SearchWP to identify related articles algorithmically, and we can set them manually as well. The images used for related articles should improve over time as we give more articles featured images. Older articles grab the first image, which is often a screenshot so it can look a little odd in this context. If you see a newspaper icon with the TidBITS logo in it, there’s no associated graphic at all. Tags and Categories: Also in the Read More area is a collection of blue boxes with text in them. These are the tags and categories associated with the article, and clicking one loads a headline page of matching articles. These will improve over time as we tag new articles and tag more older ones. For many years now we’ve had what we called ExtraBITS, which were one-paragraph summaries and commentary on articles elsewhere on the Internet. They were a special data format in the old system, which made them annoying to work with on the back end, since we couldn’t do any formatting or even add any links. We decided to retain the concept of ExtraBITS in the new system, but in a more flexible format. Now they’ll be regular short articles with full formatting and linking possibilities but with a Read Original Article link at the bottom. They’ll still be collected together at the end of the email issue. The difference between an ExtraBITS item and a short TidBITS article is that an ExtraBITS item keys off an article somewhere else and it encourages the reader to read that other article. In contrast, a standard TidBITS article of whatever length stands alone and doesn’t assume that you’ll need to read something else for the full story. A significant change is how we’re handling article commenting. Our previous system was lightweight, easy, and hierarchical, but had almost no functionality, so no formatting was possible, it was nearly impossible to quote a previous message, images couldn’t be inserted, and even links were problematic at times. We decided to go all the way in the other direction with an open-source discussion system called Discourse that’s used by a lot of other sites ranging from BoingBoing to Keyboard Maestro. Created by the guy behind the Stack Overflow family of sites, Discourse’s feature set is astonishing, but that power comes with complexity, so we’re still figuring out how best to configure it and help users. Comments still appear at the bottom of articles for quick reading, but if you want to participate in the discussion, you’ll end up clicking over to the Discourse server, which is running on an entirely different host for technical reasons. There you have nearly every commenting capability ever conceived. The system will even give you an interactive tour of its features on your first visit. Discourse does require a login to post, but it supports single sign-on from WordPress, so once you log in to the main TidBITS site, Discourse will either see you as logged in or will log you in with a single click on its Log In button. I don’t want to say much more about Discourse here, since again, I’m still learning how it all works. There is one big difference between our old system and Discourse, which is that Discourse is intentionally not threaded, for deep philosophical reasons. Since our previous system was, and since our experiments to connect the older imported comments in Discourse to their original articles failed, we imported all the legacy comments into standard WordPress comments, which do support nesting. A small number of articles have both old comments in WordPress and the option of new comments appearing in Discourse; any confusion associated with that will disappear soon as old articles are superseded. Finally, TidBITS Talk has been a mailing list for its 20-year history, but we’re moving it to Discourse as well. Discourse can be configured to treat a category — of which TidBITS Talk is one — as a mailing list so those who don’t wish to take advantage of the Discourse interface on the Web can still participate via email. I haven’t had time to discuss what’s involved on TidBITS Talk itself, but the Mailman-based mailing list will remain active for a few more weeks. The other huge change in how we publish TidBITS affects the email issue. Our previous system was a home-brew mashup of MySQL and sendmail, and while it worked fairly well, we often ran into deliverability problems that we couldn’t resolve easily. We’re offloading that work to the SendGrid service now, which we hope will result in fewer issues being marked as spam by overactive spam filters. In the past, we offered four different editions of TidBITS: full-text and announcement-only versions in both text and HTML format. That was, frankly, kind of nuts, and people would often complain that TidBITS looked lousy on an iPhone because they were still subscribed to the plain text version with its hard-wrapped lines. And even the HTML issue was extremely simple code that didn’t always display well in modern email clients. My apologies in advance to those who are accustomed to the announcement-only versions of TidBITS, but we’re simplifying everything and offering just one full-text version of TidBITS now. The rationale is that if you want to read TidBITS in email, you can do so in its entirety — the full-text versions were by far the most popular in the old system. If you’re just relying on the email version as a reminder to go to our Web site, you can always click our logotype at the top of the issue or any headline farther down to jump to the site. There is still a table of contents at the top that theoretically should scroll you to the right spot in the issue. Support for this across email clients is sporadic, though, so it may not work for you. If you have suggestions for how we could format the issue better for your situation, I’m all ears. Right now, over 20% of our Web traffic comes from people on mobile devices, which is impressive considering how bad the previous site was on the iPhone. Plus, Google actively deprecates search results for sites that don’t display well on mobile devices. So an important goal of the redesign was to have a responsive site that reformats smoothly on smaller screens. I’m pleased to say that the new site does this swimmingly. It’s trickier than it seems, since some page elements can scale, whereas others can’t. The row of Watchlist items goes from a single row of six to three rows of two on the iPhone, for instance, but we might try shrinking them more and going for two rows of three. The hardest part of the responsive site turned out to be the ad banners, since we’re using 728×90 leaderboard sizes on large screens, but they shrink awkwardly on the iPhone in portrait orientation such that they’re hard to read. Our eventual solution was to provide each 728×90 banner with a 320×100 alternate (another standard ad size) that provides a similar visual impact on a portrait iPhone screen. A CSS media query automatically replaces the larger banner with the smaller one when the screen is under 600 pixels wide. This replacement happens dynamically, so it’s kind of neat to look at our home page on the iPhone in portrait orientation, see the small banner, flip it to landscape, and watch the large banner appear automatically. The iPhone in portrait orientation doesn’t have room for the navigation menus at the top, so we put them under a ··· button to the right of the logo. It’s surprisingly effective, and while I hope we can get the TidBITS News app working again, the site is so good in Safari on the iPhone that there’s less need for the standalone app for visual reasons. Most people probably don’t realize that we have dedicated volunteers who translate every TidBITS issue into Dutch and Japanese. Relatively little will be changing for the translations — their Web sites are running on our new server, but remain static HTML files. The Dutch and Japanese mailing lists will be moving from Mailman to SendGrid, and we hope that will be more or less seamless, but it hasn’t happened yet. Eli and I have been knee-deep in this redesign for many months, and I’m extremely happy with what we’ve accomplished. That said, I don’t consider the current state of the site to be fixed in stone and I expect that we’ll want to make some tweaks as we hear from readers and get a better feel for the new technologies we’ve deployed. So feel free to contact me with constructive comments and suggestions. You can always send me email, post a comment in the Site Feedback category in Discourse, or post in the #site-feedback channel in SlackBITS. Twitter and Facebook work too, but honestly, I prefer not to have conversations in proprietary services with troubling business practices. Thanks for all your support over the years, and I’m looking forward to being able to focus more time on publishing the best possible content for you! Looks like a great improvement, and fantastically well done to avoid trackers with ads and social media. I’m using the Brave browser with dark reading theme enabled in preferences and then click on reading view to get a dark background on the Tidbits site. Excited by the new lightweight design that takes into account how users consume the content that we’re here for. I’ll be sure to re-up manually come renewal time! This looks great! The password change was nearly effortless. I look forward to exploring the new format. Thanks for all your efforts. Is the problem with Mail or the HTML code? They are clickable, at least in Mailmate. Didn’t test in Apple Mail. They move to anchor points within the email rather than launch a web view of the article. Given the length of the email, it’s quite smart, glad you pointed them out, I’ll use that. Thank you! 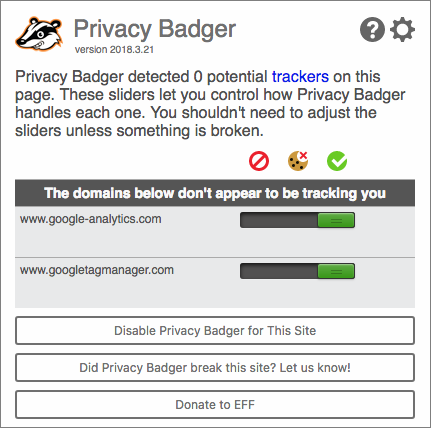 We went to a talk by a professor involved with the Princeton Web Transparency & Accountability Project last fall, and were just disgusted at the amount of effort being put into tracking users. I mean, advertisers were even tracking users by battery status! We decided then that the new site would be as clean as we could make it. Nominally, that means we’ll earn less money, but it’s not like Google AdSense ads were bringing in real income anyway. I’ve heard this from a couple of people, but I’m curious, what do you do in nearly all Mac apps that use black text on white backgrounds? Charles Maurer addressed this in “Better than the Printed Page: Reading on an iPad” and followed up with more in a comment. If the white of the Mac screen is too bright, I wonder if the solution is to tweak your display settings so it’s never so glaring. Thank you! As I’ve said before, TidBITS members really are the only reason TidBITS still exists. We couldn’t possibly have survived otherwise. While reading the newly formatted TidBITS issue #1411 on Mac Mail, I wonder why the summary list of articles near the top are underlined and yet are not clickable? What version of macOS are you using? 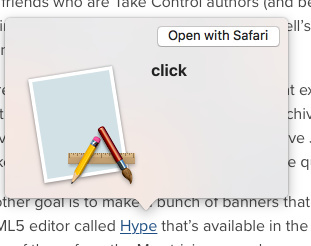 In 10.13.4 High Sierra on my iMac, clicking the links in Mail does scroll me down to the actual article start. As I said in the article, we’ve seen sporadic support for this basic HTML feature in email clients, but it does seem to be working in Mail for at least some people. Since we sent email about the accounts to roughly 25,000 people, it’s not too surprising that some email messages might have gone missing. Hopefully it will all settle down in the next few days. Wasn’t this a problem in Mail.app in… oh, maybe 10.10? I seem to recall some discussion about this a couple of years back, maybe more. Congrats to all involved, the new site and email format are fantastic! I can’t hover over a link to see where it leads to (which I often do to decide if I want to follow it). Is there any way the links in the email issue could be made to function a bit better? There are many applications in MacOS that use white background, but once in a while one makes it too much. There are more attenuated and brighter whites, and some more matt. Like everyone, I visit many pages with white background and the new website has seemed especially blinding. The problem is not to regulate the brightness of the screen because that problem is not with all the luminous websites. Maybe they just did the test only on Apple screens. I use a Benq 32’’. A little attenuation wouldn’t hurt. And maybe a dark skin for registered users. Love the look of the new web site. I am seriously going to miss the text-only version of the weekly TidBITS issue, however. It was the epitome of what plain text email should be. No need to load images I didn’t need to see, which is particularly important for me who either has no data plan on my mobile devices or a prepaid one (where data is $10 per 100 MB). Links were gathered at the end of each paragraph, making them easy to selectively load (or ignore or file for later use). I find the font in the new HTML version far too large in Mail on macOS and the formatting very awkward if remote content is set to be manually loaded (which I do on all platforms for security reasons as well as bandwidth). Also, some images are not alt-tagged and some of those images do not have a frame, making it almost impossible to determine what you are missing (or what you would gain if you load images). This is clearly a poorer experience than the previous plain text version if you do not routinely load images. I like the idea of a dark (think, daringfireball-esque) view, and sure, make it a member perk! It improved but took quite a while. My one complaint with the new email issue is that the links use some sort of SendGrid redirection. Yes, that’s built into SendGrid, and enables us to see what people really click. I don’t know if it can be turned off or not, but I’ll look into it. I’ll add it to the list, but I worry it’s one of those designs that sounds simple but is really a rabbit-hole. Love the look of the new web site. I am seriously going to miss the text-only version of the weekly TidBITS issue, however. It was the epitome of what plain text email should be. I do miss the days when 7-bit ASCII email was appreciated by more people. It did require quite a lot of work each week, though. Should be easily dropped with Command-minus, though, right? We should be ALT tagging everything, but we never did any of that before, so I fear we’re likely to be inconsistent. I do wonder how many people turn off remote loading of images at this point — bandwidth constraints are the only reason I would since it’s just a hassle otherwise. I suspect I will dump the weekly email edition that I first subscribed to back in the early 1990s and see how the RSS feed does for me. That works for us — there’s no way to meet everyone’s needs in every channel, but we hope the different channels will stand in like that. I read, that. I think I replied to it. I entirely disagree; I could not possibly disagree more. I can read my iBooks all day long; my eyes start hurting on a retina Mac after maybe two hours. Huge white screens are the bane of my existence in computers. Everything that I can set to black or dark-grey backgrounds, I do. Paper and computer screens are entirely different. Paper is not a radiant light source, and the reflected light on the page means that a white (or mostly white) page is much better for contrast. the opposite is the case with a luminous surface like a screen. There’s a reason that all screen used to be dark with bright letters. The reason for alt-tags on images is for accessibility, anything else is just gravy. I do wonder how many people turn off remote loading of images at this point — bandwidth constraints are the only reason I would since it’s just a hassle otherwise. I have remote loading turned off in all my email clients to control which companies can track the emails I look at (since images can be used to track when someone opens an email). It’s no real hassle to tap/click the ‘load images’ button for emails (like TidBITS) that I want to see the images in. You might not be aware, but there is a dark theme for this forum. Go to your settings (cog icon under you avatar in the top right) and choose Interface from the left-hand sidebar. Top option is the Theme. Yes, that’s built into SendGrid, and enables us to see what people really click. I get this, and understand why it’s useful to you. Just a shame that they can’t figure out a way to do this without breaking the loveliness of hyperlinks. I wish they could pass the URL as some sort of parameter (e.g. sendgrid.net/[trackingstring]?tidbits.com/my-great-article or something) so that it was still possible to see the destination URL and that it would maybe work with QuickLook. I realise this could be impossible/out of your control, but thanks for checking. Took five tries to reset my password; the reset link(s) you sent returned ‘invalid token’. You’ve also broken Safari passwords, as far as setting a new one; yes it’s helpful you suggested one; yes, I know you like 1Password better; but Safari is just fine for most everyone and presents zero barriers (or cost) in syncing across all macOS and iOS devices; I had to jump through hoops to generate my own and install it in Safari. The new website is gawdawful slow; I’m getting a 10-15 second delay on every click, before it even attempts to load a new page, then another few to several seconds to complete. Text replacement also appears to be broken in this comments field; common text replacements I’ve set are not working. I, too, will be unsubscribing from the email and hoping RSS works well enough (assuming you get your speed issues resolved). I’ve loved the content and service since shortly after you launched way back when; I’m all for updating to keep up with the times, but sometimes a step forward for forward’s sake can be backwards if you’re just adding complexity to what was (infamously) great for its simplicity. Complaints notwithstanding, congrats on your efforts; I hope they deliver the benefits you’re expecting. What version of MacOS are you running? I’ve not had any of these issues on the new website running MacOS 10.12 Sierra on a 2013 MacBook Air. Site is snappy and responsive, text fields worked as normal, and Safari saved my password as expected. Could it be a software issue on your end? Further, every site in the world generates strong passwords for you, and don’t activate/allow Safari’s own password generator; they all also recommend you use 1Password instead. Your experience may have been different, I don’t know; but I was presented a page that seemed to have no method to use Safari’s Password features. And I’m certain it must be me, again, who did something to break text replacement in Discourse, even though I just used Discourse over on the KM forum, and it worked in at least eight instances. And in spite of everything else loading from essentially instantly to just a couple-few seconds for image/ad/script heavy pages, I’m sure it’s my dual 3.2Ghz Mac Pro with 52GB of RAM and a fully up to date Safari 11 with just a few extensions installed, that otherwise works fine on pretty much every other website, is the problem. Crazy to think a brand new website design, requiring its entire membership to reset their passwords, could be under stress or have design flaws. (; I just like to jump to conclusions without testing and comparing before reporting, and assume that the website I’m experiencing troubles on is to blame. But thanks for suggesting possible issues; no doubt the TidBits audience is indeed running some seriously old hardware and could well be running Snow Leopard. I know a few, to be sure. They are not going to be happy with the email changes, for sure. I don’t know what’s going on with that. It works fine in our testing and for most people, but a non-trivial number of people are having issues. We are having some serious performance issues at the moment, and I’m wondering if those may be related. We haven’t broken anything intentionally — can you provide steps for what didn’t work and what you expected to happen? I’m not sure what you’re saying here. Is there a Discourse setting you’re aware of that we may have set wrong? Crazy to think a brand new website design, requiring its entire membership to reset their passwords, could be under stress or have design flaws. Yeah, there’s something going on right now. Eli is out picking up his kid at school, but hopefully he can figure it out soon. The caching has been killing us — everything that’s supposed to make the site faster has been problematic. Hi Adam, once I finally got a password reset link that worked, I was presented a page that had already filled out a “strong” password, but, as I wanted to be sure I had it stored in Safari, I entered the field and expected to be presented with a typical Safari popdown menu, offering to autofill (and record) a new password, or at least offer to autofill from storage. Realizing it might not recognize the domain due to new cookies, I tried clearing the field, reloading the page (took about 40 seconds), etc., and a right-click only offered 1Password, of course. I had to generate a new password of my own, hit the reset, then open Safari prefs and paste in the new password; logout/login to be certain it was recorded. As I said, hoops. I don’t know how to configure Discourse on the server side; I just know that macostext (the prior should have auto-replaced to macOS Text Replacement) isn’t functioning in this comments entry field as we speak; whereas it works perfectly well over at KM. If there’s a user setting to make that happen, I’ve never found it, but I’ll look again. I no longer use TextExpander, so I’m unable to test that. Sorry your server is getting destroyed; thankfully for most of your audience, it’s not mission critical and we can patiently await things to smooth out. You, not so much. I have to agree with you, the new layout and appearance is vastly improved; I’ve had you locked in Reader mode for a long time because my tired old eyes didn’t agree with the dark border bocks, either. In any case, it truly was looking quite dated (sorry, Glenn). I’ll probably still use Reader mode for longer articles, although I do most of my reading on ios (again, should have replaced as iOS) using RSS/FeedlerPro/Fiery. So there is. It’s pretty awful though. No need for all the sarcasm! Was just offering a suggestion to try and figure out why you were having problems. I didn’t know anything about your setup. Don’t worry, though, happy to leave you to it. That seems very odd. I just tested and the macOS text replacement isn’t working in Chrome, but it is working in Safari. Not sure why it wouldn’t work for you. Yeah, seriously. In the early days of a new server, every little hiccup is a red alert. Either Eli fixed it silently last night, or it got better, since the server is snappy again like it’s supposed to be. “SendGrid service now, which we hope will result in fewer issues being marked as spam by overactive spam filters.” – This was the first issue of TidBits ever that landed in Spam … ;-/. This was the first time to login to the new TidBits site and at the two first pages I followed to login and reset password on the WP pages I had to reload the page to make it show anything other than a blank page in Safari … . (WP is standard, but guess I am not much of a fan … but Safari often have problems showing blank pages elsewhere too.) Other than that – all fine so far. I am running iOS 11.3 on an iPad Pro and had 4 attempts to change my password. I found your site to be running very slow which caused the problem of failed attempts. The emails with links took several minutes to arrive. Regarding white text on black backgrounds I have iBooks and Kindle set that way. My eyesight is 20/20 and is tested every year. However, I wear Photocromic glasses whenever I am outside and have done since I was 15. There may be a link. Sorry, I should clarify, I have no affiliation with TidBITS, just a long-time subscriber/supporter trying to offer suggestions on this public forum. According to Adam, who is one of TidBITS’s founders, there were performance issues with the site. From the outside, I certainly wouldn’t expect a modern iPad Pro with 11.3 to have problems with the site, maybe @ace can provide further insight. It might help him if you have an idea of the rough timing when you had problems with the password and slow site (e.g. last night? this morning?). Also, I never received any notification about logging in… and didn’t realize that I had to do anything until I saw the posting on TidBITS-Talk. Apparently, even tho’ I get TidBITS-Talk through my gmail account, when trying to log in, I had to use my ancient AOL account. I’m in but things don’t seem to be working smoothly… had to log in several times before I could post to this discussion, and when trying to ‘edit’ my account, I got ‘thrown’ back to your Home page. (Related to this, is there any way to change my ‘official’ email address to my gmail address? … or do I have to re-register and possibly re-pay? Changing my official email address is why I attempted to edit my profile.) BUT, remember all these problems occur with older browsers. Out of interest, how old are these older browsers? Yes, you are correct; I absolutely should not have been so sarcastic. It was very rude, and I sincerely apologize. I have currently six other open trouble tickets, three of which have been going for weeks, and even months; and each of those has gone on needlessly long because the tier one support insisted on several rounds of FAQ, RTFM, and ‘we’re not seeing any issues or similar reports…’; as a former Tier 3 support specialist, IT manager and programmer with four decades of eyebrow-deep computer experience, my patience for ‘did you try flipping the power switch?’ was completely worn before your kind attempt to suggest a valid solution. it’s not an excuse, just an offer of explanation from a(n apparently now I’m a) crotchety old man. Your feedback is appreciated, and I will endeavor to recheck my attitude, store my frustrations and not attack genuine offers of help. Again, I’m sorry; I hope you can accept my apology. LOL! As I just observed in my apology to Jolin, suddenly macOS Text Replacement is working in Safari today; I haven’t even restarted Safari from yesterday; nothing but a new tab (of which I tried a few yesterday). Weird; unless somehow I downloaded new, fresh JS libraries from you today or something, nothing on my side has changed. In any case, I’m happy. Site is snappy too, and I have no plans to change my generated password, so consider me good. BUT I’m having multiple problems with older browsers. I didn’t see any specifications about browser (or MacOS) limitations anywhere. The primary issue that I encountered (aside from the password issue, see below) is that none of the menus are functional in the older browsers. (I’ve tried three: Firefox, Safari, and Chrome. I have verified that old iPad browsers (original iPad and iPad 2) don’t support the menus. I presume the same would be true of desktop browsers, but it’s very hard to keep old browsers around for testing to know how far back that goes. What versions are you using @aliamm? I can’t promise anything, but if there are easy fixes, we’ll do what we can to make things work further back. Performance problems have continued to dog us, and they may be responsible for some of the login issues as well. We keep making changes to try to fix things. There’s no need to log in other than to make comments for now, so if you have trouble, just wait a bit and try again. With regard to the reset password emails, some people are seeing delays, where the message shows up 30-60 minutes later. Not ideal, obviously, but not something we can control. Worse is when ISPs are blocking the messages as spam. We can look that up in SendGrid, but there’s nothing we can do at the moment to prevent it — you’ll just have to complain to your ISP that their spam filters are blocking legitimate mail. No problem, we all have bad days, and I can imagine how frustrating that all must be. Thanks for the apology. As mentioned in my posting, other sites work just fine. I have gotten notifications about using older browsers, but as far as I can tell those sites still work as they have always worked. Also, I haven’t encountered problems with WordPress sites except for TidBITS. If necessary, I can boot up into a Sierra partition. I normally don’t go to the TidBITS website, so I don’t know whether it’s worth your time to deal with this. Mainly I just read the TidBITS talk digest that I still get through my gmail account. Mainly, I’d like to change my account’s email address to match, but as far as I can tell, I’d have to do that through the Sierra partition if it’s possible. Adam, I don’t worry about the bandwidth (Ethernet at a National Lab is usually quite snappy), but I do worry about tracking. I seem to recall spammers being able to recognize if a human actually read their email by tracking the loading of remote images containing a unique identifier. If their servers show that image was loaded, they know somebody opened that email. Not just that, thanks to the unique identifier in the image, they know exactly which email address is “alive”. But I’m by no means an expert. It would be great to hear form you guys if this scenario is real and if so, what else could be done apart from turning off remote image loading. Obviously, if you know something’s spam right away, there’s no need to open the email (which would then load the remote image). But every once in a while opening an email is the only way to check if it’s actually spam. I seem to recall spammers being able to recognize if a human actually read their email by tracking the loading of remote images containing a unique identifier. If their servers show that image was loaded, they know somebody opened that email. Not just that, thanks to the unique identifier in the image, they know exactly which email address is “alive”. My understanding is that spammers don’t care. They’re just spewing spam at every imaginable address they can find or invent — lots of spam I saw on our mail server comes to addresses that never existed and were just being guessed at. With spam these days, I see no advantage in wasting time or brain cycles on trying to outwit spammers. Just put a good spam filter in front of your mail and accept that it will sometimes fail and catch legitimate mail, and that it will sometimes fail and let spam through. Life is too short and nothing you can do will prevent you from being spammed. Thanks for the list of older browsers, @aliamm. I’ll report the menus not working as a bug and see if Eli can fix it. As far as changing your address, if you send email to [email protected], Lauri Reinhardt can update it for you. Do note that that won’t affect TidBITS Talk at all, and that the TidBITS Talk mailing list as run through Mailman is going away shortly, replaced with the TidBITS Talk category here on Discourse. I’ve got a 30" Apple monitor, but I find the new layout and typography to be extremely wasteful of my screen space. You scroll and you scroll and you scroll. To me, the best comment format is in Ric Ford’s Macintouch. I think Ric is using MyBB. Personally, I think his line lengths are too long. I’m not sure there are that many more vertical lines per screen in his system. But Ric’s a good guy and everyone is welcome to their opinions about what is the most readable. Apologies if I missed it–this is a long article/thread–is the TidBITS News iOS app no longer supported? I’m getting an error message about a missing feed. If you’re leaving it behind, perhaps put up one more item that explains the situation? I like the new look, especially the logo! I’m running VIenna (Version 3.3.0 :7f06bb62: (6805) ). Each time I hit “mark all threads as read” and Vienna refreshes, all the TidBits links come back again. (Tidbits is not the only site with this problem.) I suspect it’s a bug in Vienna, but thought I’d mention it so you could take a look. Also, what are you-all using for hardware? 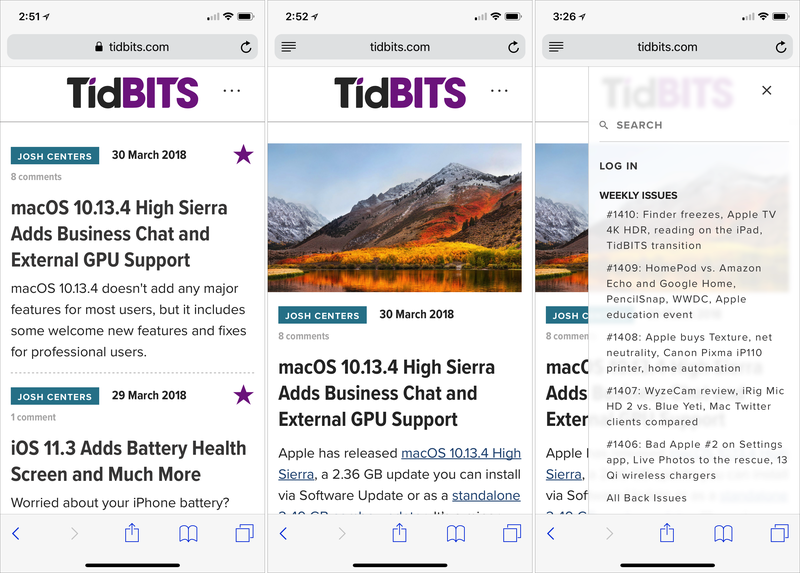 Apologies if I missed it–this is a long article/thread–is the TidBITS News iOS app no longer supported? Yes, it’s broken right now due to differences in the feed formats. Check the article linked at the top of this thread. I think that would be a Vienna bug, although I will say that I’ve been testing our summary and full-text feeds in Vienna, and I haven’t seen this behavior. I’ll pay more attention now. Well, after composing a message to Lauri, I thought I’d check the site one more time. This time I was able to actually edit my profile to indicate my gmail account as my official email address. So, I’m set there, but I think that Discourse is still using the old AOL address (because of the avatar pic being associated with that account from the ‘old’ days). So, I may have to go through another cycle here. Are you saying that there won’t be a daily summary any more, and I will have either do an RSS feed or to log in here to follow threads in TidBITS Talk? A lot of the TidBITS Talk discussions don’t relate to articles, so I’m not sure whether I’d bother logging in to read comments about articles, which I haven’t received in years. Will there be something from the weekly mailing that would link to relevant discussions in TidBITS Talk so that I can selectively view threads of interest? From what I see in the article, the TidBITS Talk issue seems to be a work in process. Glad you got it sorted. I somewhat decoupled WordPress and Discourse so people could have different information in both places, so yes, you probably do have to set your email address here too. Just click your avatar in the upper right corner and then click the gear icon. There certainly won’t be a Mailman-style digest. However, Discourse has a lot of notification settings and can send email as well, so you could get email notification of new topics and then follow them. I’m really not certain of all the possibilities right now — I’ve had many, many more important details to focus on with the main site. But I’m going to start a thread in the #site-feedback category to see if we can work it out together. However, Discourse has a lot of notification settings and can send email as well, so you could get email notification of new topics and then follow them. You then need to look at your notification settings (gear icon under your avatar, top right) to see how you are notified (for instance, I just get a little blue circle on my avatar, but I think you can set it to email you). It appears the email list is being handled by the Wordpress info right now, and not the discourse info, is that right? At least when I went into my profile via www.tidbits.com > Email > Login it shows my wordpress email. I am guessing there is a phantom Wordpress user with my list email address, but I haven’t gotten that far. Yes, as far as TidBITS email (such as issues, or articles for members) goes, as opposed to Discourse notifications, WordPress is the truth for that address. So far, I have been completely unable to comment directly on the article page. Even this comment had no input field on the main article page. And I am completely stumped on how to make a comment on articles marked “No Comments.” Unless there is already a comment and I can find it in the Discourse forum, I cannot comment. I know I can use Discourse because I’ve used it on other sites. If there are no comments, there is a link at the bottom of the page that says something like “Start a discussion” which is a link to discourse. So far, I have been completely unable to comment directly on the article page. Even this comment had no input field on the main article page. Because Discourse has an extremely capable editor that can’t be embedded on non-Discourse pages, you have to click through to this site to add a comment. And I am completely stumped on how to make a comment on articles marked “No Comments.” Unless there is already a comment and I can find it in the Discourse forum, I cannot comment. There’s a bug that prevented me from making Discourse topics for the last couple of articles. Eli will undoubtedly fix it this morning (it happened late on Friday) and I’ll get the links made for those last few articles right away. Every article since the transition should have a Discourse link. Older articles won’t, though we can always open them up again if need be. Thanks, Adam. I figured it was probably a bug since this only happened on one of the most recent articles. And of course these bugs pop up on late Friday when everyone wants some time off. Just to clarify, I was clicking on the “No Comments” link at the top of the page and it took me nowhere. That seemed odd, the other articles with existing comments all worked fine. Ah! Yeah, I think that was related to the fact that the link hadn’t yet been created. Clicking No Comments when there aren’t any should take you to the bottom of the article where you can click through to Discourse to make one (and it does on those articles now). I was able to successfully comment now, so that was definitely it. BTW I use another site with Discourse, it puts the first 3 comments at the bottom of the page with the link to go to the Discourse page. You might check out Talkingpointsmemo.com and look at their story pages to see how they do it. It’s an excellent political reporting site too. Anyway, having migrated a few sites (like my own, and my clients) I am stunned just to think about the work of moving so many years of content to a new system. Great job overall (and of course these little glitches are so minor compared to that). BTW I use another site with Discourse, it puts the first 3 comments at the bottom of the page with the link to go to the Discourse page. You might check out Talkingpointsmemo.com and look at their story pages to see how they do it. Thanks! The Discourse plug-in for WordPress lets you set the maximum visible comments, so they must have chosen a fairly small number. I set ours for 50 comments, so if people just want to read the full discussion but not reply, they can stay on the main site in most cases. Thanks for the kind words and the understanding! I feel like I have bees in my head, with so many little details to track. It looks great in Tbird and even better on the web; Well done! Just to add another (probably minor) issue that occurred to me today on reading Juggling TidBITS Infrastructure Issues: Presumably if you switch away from SendGrid (whether now or in 20 years), the links in existing email issues will stop working. There’s probably no way around this, and it probably doesn’t matter (lots of links die anyway), but as I archive every email issue of TidBITS, it makes me just a bit sad. It got spam flagged the first time. Saw some of the weirdness in the e-mail of the weekly column in iOS Mail but looked fine in Apple Mail. Presumably if you switch away from SendGrid (whether now or in 20 years), the links in existing email issues will stop working. Oh! You’re probably right, and I hadn’t thought of that until now either. The other downside of the link tracking is that it makes previewing the links impossible. Again, minor, but annoying. My feeling right now is that I want to leave link tracking on for another couple of weeks so I can get an impression of how people interact with the articles and issues, but then it makes sense to turn it off for these two reasons. Maybe it becomes something you turn on for a couple of weeks two times a year, or something like that? I can completely understand wanting to have insight into how people use the email issues. Shame there isn’t a more elegant way to get this. I’m having multiple problems with older browsers. I didn’t see any specifications about browser (or MacOS) limitations anywhere. The primary issue that I encountered (aside from the password issue, see below) is that none of the menus are functional in the older browsers. @aliamm Can you test again in these browsers? We made some changes, but it’s hard to test since we don’t have all the same apps. My apologies. I am not sure what Webbit hole I fell in, when I went back the format was beautiful. I’m impressed. Congratulations to your web designer!